Home » [Cakewalk Products] » SONAR » Friday's Tip of the Week #167: Behold! Dual Mono Becomes Stereo! Helpful ReplyFriday's Tip of the Week #167: Behold! Dual Mono Becomes Stereo! Friday's Tip of the Week #167: Behold! Dual Mono Becomes Stereo! The "Friday's Tip of the Week" was one of those things that was done on a whim, but took on a life of its own and after 120 tips (far more than the 31 that were planned originally), it started to get unwieldy. It was unorganized, most of the tips needed revising, some were obsolete, screen shots showed a GUI that was no longer in common use, and there were some typos and other issues. It was time for a clean slate, so in early November I updated the tips, folded in more tips, fixed the typoze, expanded on some of the explanations, added a table of contents, and all that other good book-like stuff. Then I gave advance notice I'd delete all the old tips in this thread, and start over again with a new series of tips....so here we are with a sequel, as well as a full-blown book. The book is 311 pages in PDF format, and is now available in the Cakewalk Store. You can download the Table of Contents to see what's included; chapters include MIDI, SONAR Workflow, Patch Points and Synth Recording, FX Chains, Automation, Tempo and Pitch-Shifting, Signal Processing, AudioSnap, Step Sequencing and Beats, Colorization, Loops, Melodyne, etc. - 120 tips in all. Thanks for your support, your enthusiasm about this venture, your comments, and your participation. This is a great community, and you'll note that this thread retains some of the top community-contributed tips that were scattered in among the original 121 tips. I hope you enjoy the book. And yes, the index will continue...for old times' sake, we'll pick up the tip numbers where we left off. Week 122: Clean Up Your Console View - Don't you wish the Console View could show Track Folders, and you could unfold and fold them? Well you can't, but here's how to have something very similar. Week 123: SuperKick! Tune and Enhance Your Kick Drum - You can have a kick drum, or you can have a kick that could be mistaken for a seismic event. Here's how. With audio demo. Week 124: "Percussivate" Your Part - Here's the easy way to impart rhythmic effects, polyrhythms, and interesting syncopations to sustained parts like pads and power chords. EDMers, take note - but this tip is about more than just that. Week 125: Multiband Sidechaining - Use one audio track to "cross-modulate" another track, using multiband sidechaining with gates. With audio demo. Week 126: Linear-Phase EQ vs. Non-Linear EQ...Huh? - Cakewalk's Linear-Phase EQ has both a linear-phase and non-linear phase mode. Why does it matter? Which should you choose? What's the difference? All is revealed in this tip. With audio demo. Week 127: Random Bass Line Creator - No, you're not going to replace Will Lee or Brian Hardgroove. But download a free MFX, then let SONAR swing into action and come up with some potentially useful bass lines. With audio demo. Week 128: My New BFF Shortcut - When editing tracks, being able to switch between the Now time rewinding to where it started, or stopping where you stopped the transport, is vital - and this particular shortcut implementation works really well. Week 129: Jamstik Meets SONAR - Although not really intended to be a Windows-oriented MIDI controller, the Zivix Jamstik can provide this function - and is particularly well-suited for use with Rapture Pro. Week 130: The “How Does It Sound in a Car?” Tester - Are you one of those people who won't sign off on a mix until you've heard it in a car? Take the process to a more repeatable level with this novel FX Chain. Week 131: SONAR's Dr. QuadraREX File Player - Play up to four REX files at once, play individual slices, drag MIDI files to the track view, modify the sound with Dim Pro's processors, trigger and transpose loops from your keyboard - it's all here. Week 132: Delay-Free Faux Stereo - When you want to convert mono to stereo, there's more than one way to accomplish your goal...and this one doesn't require delay. Week 133: Console Emulator Workflow Tip - If you use the Console Emulator, you already know why it's cool. This tip is about quickly verifying that all console channels have a CE, and that the settings are as desired. Week 134: SONAR's Secret Time-Based Guitar FX - There's a really cool chorus that's not like other guitar choruses, as well as a pseudo-Echoplex - but you have to know where to look for them. Week 135: An Efficient Workflow for Pre-Masters - Yes, you need to master your final mixes. But there's a very important step that needs to be taken before that, and here's an efficient way to go about it. Week 136: Sonitus Presets - Yes, We Can! - Sonitus plug-ins are seriously cool...so much so that I keep creating presets. But managing those presets properly can be a little opaque--so this tip reveals all. 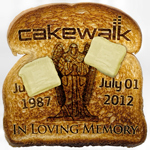 Week 137: Get More Out of TH3 Cakewalk Edition - The Cakewalk Edition of TH3 doesn't have an equalizer...or does it? Turns out that it does - with highpass, lowpass, bandpass, and notch responses - so this tip tells you how to access it. Week 138: WTF Craig...Harmonicas? - One of these tips is not like the others...and this one is it. Check out why blues harp has merit, and how to get that down and dirty blues harp sound in SONAR. Week 139: The Reason Why You Don’t Want to Compress the Master Bus - If like me you treat mixing and mastering as separate processes, this tip is important. Week 140: SONAR's Incognito Lo-Fi Plug-In - Just when you thought you knew everything about Sonitus effects, it turns out there's an incognito lo-fi processor that can get seriously nasty. Week 141: The Humanized MIDI Hi-Hat - Even if you're doing electro or other musical genres that typically expect highly-quantized parts, a little humanizing can bring a fresh, more interesting vibe. Week 142: What Is the Sound of Two Hands Clapping? - Probably not all that great, because handclaps are deceptively hard to record. But take heed of these tips, and you'll have better results. Week 143: Using BLE-MIDI (Bluetooth MIDI) Devices in SONAR - "Cutting the cord" isn't just about removing the evil entity known as "TV" from your life, but getting rid of MIDI cables and using wireless controllers - thanks to Bluetooth MIDI. Week 144: Four Quickie Automation Tips - Being able to navigate quickly among common functions is always a good thing, but not all shortcuts are obvious - so here are four ways to speed up working with automation. Week 145: End Boring MIDI Drum Patterns! - "Friday's Tip of the Week," or public service announcement? You decide! Once you figure out the settings, the results are pretty amazing. Week 146: The Perfect Fadeout - When you want to fade out a song using master bus automation, you can either take the time to place nodes exactly where you want them...or save much time by using this tip. Week 147: Gourmet Flanging - Looking for ways to get the “tape flanger” sound of "through-zero flanging" without tape? Here's a way to get ever closer to that sound. Week 148: How to Use the New Drum Exciter Plug-In - Sure, the 2017.05 update has a lot of cool stuff in it. But that's no excuse to ignore the new Drum Exciter plug-in for Professional and Platinum owners. Week 149: Morphable LFO Auto-Panner - SONAR doesn't have a versatile auto-panner - or does it? Here's how to create an auto-panner with over 48 waveforms, sync, MIDI control, and dual morphable LFO waveforms. Week 150: MIDI Velocity "Compression" with the Transform Tool - The new Transform Tool is your one-stop option for dynamics control. This tip shows how to use it with velocity, but the same technique also works with other controllers. Week 151: Super-Long LFO Waveforms - The drawing tool for automated LFO waveforms does have a significant limitation—it can’t draw “frequencies” slower than 1 measure automatically. Fortunately, there’s a simple way to do this. Week 152: Build a "Virtual Room Mics" FX Chain - Let’s improve the acoustic environment in which your instruments live, by faking—uh, I mean, “emulating”—a pair of room mics. And all you need is a simple FX Chain! Week 153: SONAR's "Secret Weapon" Convolution - Applying convolution to sounds can do a whole lot of interesting things, and SONAR has a "secret weapon" for convolution beyond REmatrix Solo. Week 154: Re-Discovering SONAR's Audio Waveform Editor - With audio in the clips pane, it seems lots of zooming and resizing is needed if you want a single track to fill the screen. Not so! Week 155: Reverb Tools for Bigger Reverb - Want a bigger, wider, more interesting reverb sound? Of course you do, so keep reading - and try Reverb Tools as an FX Chain, too. Week 156: Let's Get Punchy! - Sure, comping gets all the glory. But punching has a lot of users, and there are various options with both manual and auto-punching that are worth exploring. Week 157: The Missing—and Non-Missing—Link - This is an “eat your vegetables” kind of tip, but SONAR's ability to link and unlink clips has been around for a while - so it seems like a good time for a refresher course on this handy feature. Week 158: Wireless, Hands-Free SONAR Control - Ever wanted to be able to send keyboard shortcuts via footswitches? Well, you can - and it's easy to accomplish. Week 159: The Matrix View Sampler You Can Trigger with MIDI Tracks - The Matrix View lets you drag in slices, and trigger loops and one-shots--but you can't trigger them from SONAR MIDI tracks unless you know what it's this tip. Week 160: Cut Audio Groove Clips into Slices - Easily! - Wouldn’t it be great if you could treat Groove Clips like REX files, and extract individual slices quickly and easily? With SONAR, you can. Week 161: SONAR Audio Stretching Options Explained - SONAR has five ways to stretch audio files, and it's important to choose the right tool for the right job. Week 162: Here's Your Harmonic "Tremolo" - Some of the older, Fender “brown” amps used a variation on the standard tremolo which the company called a “harmonic tremolo.” Now you can make one in SONAR. Week 163: How to be a SONAR Power User - If you want to use SONAR in a smooth, efficient, fast way, you need to know how it works - and this tip gives a strategy for an efficient way to learn SONAR's basic features. Week 164: The Case for Bass Multiband Compression - Sure, a lot of engineers will use a standard LA-2A-type compressor...but check out how the Sonitus multiband compressor can convert your bass sound from mild to mighty. Week 165: The Modeled Guitar Tone Control - A lot of people think that guitar tone controls just roll off the highs. Well, yes…but…they also interact with pickups to produce a midrange peak, as modeled in this simple FX Chain. Week 166: Perk Up Percussion with Probability - Few sounds are as boring as placing a percussion note on every step of a step sequencer...but we have ways to make those percussion parts much more interesting. Week 167: Behold! Dual Mono Becomes Stereo! - This keeps coming up as a forum question, and I answered it in a post briefly...but feel it deserves “sticky status” and a more thorough explanation. One of my favorite tips is to add the power button for the ProChannel to a quick group so that all the FX for a subset of channels can be turned on and off with one click. This is particularly useful if you are working at the limits of your computer and need to recover a lot of processing power on a regular basis without disabling all FX. If you go to Console View, you can use quick group and ctrl+add the power buttons to a group so that they can be flipped on and off, or have sets of PCs that invert... Inverting can enable you to A/B different FX. Some time ago I made a yellow DropZone and dressed up Cakewalk's SI-Bass, an elaborate example of how far you can go using a photo editor. You can also change the order and appearance of the layout by editing the GraphicResources.cwres and LayoutResources.cwres files, as I did for the SI-Bass. Gain-staging is just as important for software as it is for hardware. Some VST effects model being over-driven as well as being driven in a more typical manner. This means that when you run hot into the VST you get the over-driven sound. Some VSTs really don't distort on being over-driven until you clip. If the VST is in the FX Bin in the pro-channel, you should see the pro-channel clip light flicker red when you clip a VST. For when you are over-driving a plugin, your ears are the best judge. Input Gain on your Pre Amp and Interface give you your initial signal. Whatever changes these make to the signal are permanent. 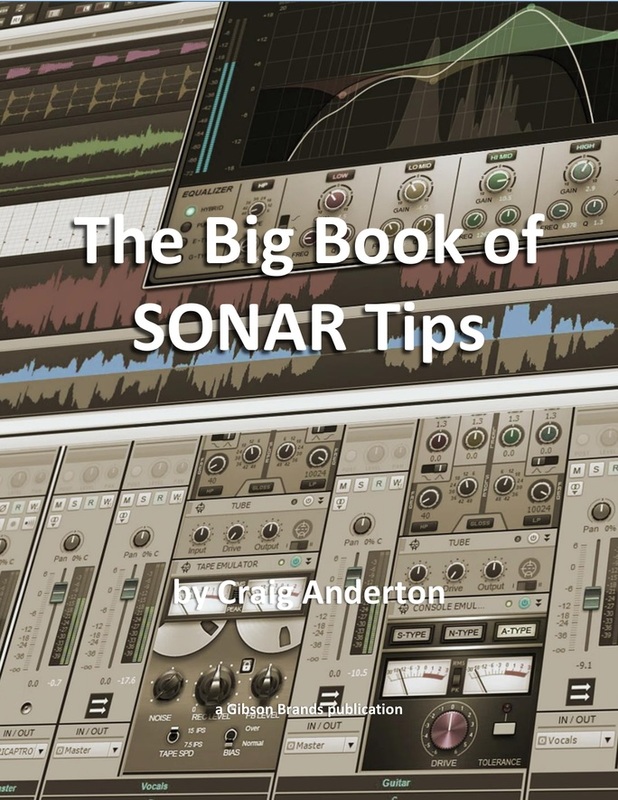 For example, if you over-drive your pre-amp before you reach Sonar, you can't undo it in Sonar. For this reason, people usually try to record fairly cleanly and dirty things up in Sonar. This gives you the flexibility to undo things you don't like. Effect Send is a place you can impact gain going to a bus. You can then also use the bus gain nob to further adjust the gain. Every track has an input gain nob. This nob cannot be automated for some reason. I use the input gain nob fairly regularly. For example, if I've got a track sounding the way I want but there are a few momentary clips during playback, I might turn the input gain down a few DB to compensate. You can adjust the gain on a specific clip. If you split a clip at zero crossings, you can then adjust the gain of the clip (or normalize the clip to make the gain adjustment more permanent). If there are just one or two large spikes in level on an otherwise consistent track, you can split the clip around those peaks using snap to zero crossings so you don't get a click. Then use normalize or clip gain to reduce the relative level of that odd transient to be more in-line with the rest of the track. This basically helps you be a very good manual limiter. If you have an FX Chain in the Pro Channel, you have gain staging built in. You have a slider for the gain coming into the chain and another for the gain coming out. These sliders should not distort the signal (unless you clip the signal). They only adjust the heat of the signal into the VSTs or into the subsequent signal chain. The Tube Pro Channel Module has an Output knob. If you keep the drive all the way down, you can use the output nob on the tube module to adjust gain staging or general track volume. Unlike the Gain nob on the track, this nob can be automated. Sometimes, when I want to reduce the volume for a track in the mix without moving all the fader automation or using off-set mode, I might use this nob to make slight tweaks. Sometimes I record for hours at once while a band plays through all the songs they know, and then I go back and mix those songs. When one song is significantly quieter than the others, I may want to use the normalize function. Process > Apply FX > Normalize. I do not normalize to 0 very often. I usually normalize to -3 or so depending on the track. This leaves headroom when going into the VSTs. Sometimes you just want to see the wave form more clearly. You don't actually need to change the track gain, you just want to see a particular transient very clearly. An example situation is that if you used two DAWs that were clock sync'd to record a performance and then moved all the tracks to a single DAW and wanted to line them up. 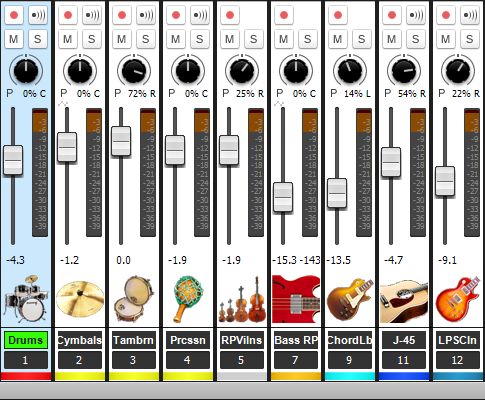 You might pick a particular drum beat, zoom WAAAAY in and then adjust the tracks to align perfectly. For this purpose, it's useful to know that you can go into track view, put the tracks side by side, Set the Edit Filter to Clips and then in the gray bar between the track headers and the wave form views click and drag up. This will make the wave form get bigger so you can see it better. Drag down to make it smaller. Double click to reset it to default. ** I have never used Channel Tools to adjust gain staging. Channel Tools does have meters than can give you a picture of your levels at a particular point in the signal chain, but I would shy away from the mid/side gain nobs on the plugin and use some other method to actually adjust the gain. Just thought I'd mention Craig's "X1 Advanced Workshop" series vids for those enjoying these little nuggets of wisdom (like I am) because they are still in the store and go on sale every now and then. There are few of these tips I remember from that series and it's cool to see them done on screen within the program. Even though it's all done in X1 since they mostly seem to be production tips as opposed to strict Sonar tuts they are all still relevant (maybe a few steps need to be tweaked for more current versions). I got them when I bought X1 Production Suite and every time I watch them I pick up something new. So if you want to see Craig perform some of these tricks (albeit it in X1 but that doesn't really matter for most of the stuff) and many more I encourage you to snag those vids if you get a chance. They contain some very cool stuff. The following was posted by Kylotan but it was a post buried in a thread. I think this info is really useful, so I'm pasting it here so it doesn't get lost in the noise. It explains what data defaults to which locations. Plugin layouts normally end in AppData/Roaming/Sonar Platinum/etc. It's usually a good idea to have AppData being backed up regularly, although the only other user-editable Sonar data likely to be in there is Drum Maps. Channel/Multi - for channel strips and multi-fx units. 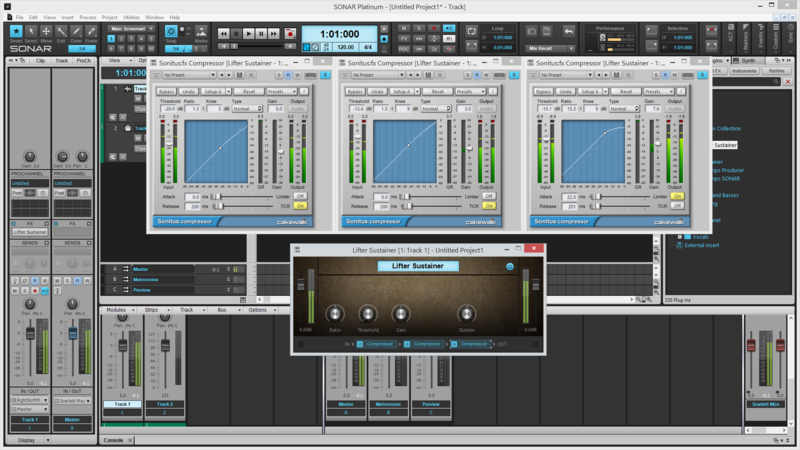 Includes Channel Tools, Percussion Strip, Vocal Strip, etc. Synths as FX - dumping ground for VSTis that can double up as multi FX - Absynth, Reaktor, z3ta+, etc. I also wish PIM could be exported "offiline" and edited via say Word or Notepad?? That would make sorting and setting up much easier. The good news: It's an XML file, so you can open it in Notepad. The bad news: Your head will explode trying to edit it. Once installed, I recommend going to Plugins > Plug-in Manager > Show Plug-in Manager and select XML Tools and Install to help out with the XML editing. Note that the files have a .PGL suffix instead of .XML. I started using Menu Magic to organize the plugin menus and I like it (http://www.agitatedstate.com). I combined the two together and it is one the the sweetest guitar compressors I've ever come across. Thanks for yet another great tip, Craig! I've made a little video tutorial on how to make SI Drums sound more human-like, and also, get rid of the dreaded "machine gun" effect. This also works in Music Creator 7 and with Session Drummer 3. Synthesizer sounds with lots of harmonics that are generated "in the box" can benefit from recording at a higher sample rate or oversampling. This audio example shows how SONAR's "Upsampling" function provides the benefits of higher sample rates at projects with lower sample rates, resulting in better high-frequency response and minimized foldover distortion. The first synth figure sounds terrible - it's "undersampled" at 1/2 the project sample rate. The next one has the same sample rate as the project, while the next figure using the Z3TA+ 2's "2x oversampling" option. This provides the same result as recording at an 88.2 kHz sample rate without using oversampling. The next example enables SONAR's "upsampling" function which doubles the synth's sample rate once again, providing the equivalent of 4x oversampling at the 44.1 kHz project sample rate. Note how it sounds very different, and a lot cleaner, than the previous examples. Finally for comparison, the last example is the sound of recording the Z3TZ+ 2 at 88.2 kHz with 2x oversampling. Note that it's the same sound as recording at 44.1 kHz with 2x oversampling and SONAR's upsampling. Now, be aware this kind of dramatic difference occurs only with synthesizers whose sounds are generated "in the box," and which generate lots of harmonics. However as you can hear, the improvement is substantial in terms of hearing what the patch is really supposed to sound like. MPH: Is there a global option in Sonar to enable upsampling for recording/playback? CA: Yes, the 2X button in the Control Bar will enable upsampling with all plug-ins that have upsamping enabled. MPH: Will the upsampling have a similar effect on amp sims, effects? CA: It depends. Most amp sims oversample already, but I've noticed some other things...like TH2's amps sound the same, but the reverb image is "tighter" when upsampled. Some effects, particularly limiters and any effects with super-fast rise times, may benefit as well. PeteL: Do the upsampling benefits pertain to sampled VSTi's? I'm assuming that by "in the box" you mean algorithmic sound generation, therefore excluding such sample playback instruments as Vienna Symphonic or Kontakt sample libraries. CA: Correct. With sampled instruments, the audio has already been band-limited, so the audio will not generate high enough frequencies to interact with the clock. The dramatic effects occur with algorithmic sound generation or processing. However...I'm still finding out the fine points of upsampling, so there may be other aspects that need to be taken into account. The one thing I would avoid is upsampling all plug-ins, because it takes longer to render. Only upsample the ones that need it. Excellent tip, as always, Craig, thanks! I've made a Vocal FX chain based on this tip and would like to share it with the community. Note: 1/4 to 1/2 delay switch may not work as intended, due to Sonitus Delay not responding to changes in the Factor field from FX chain unless there's a mouse click in the plugin itself. Will report it to devs, maybe it can be fixed. Good to see it can be useful. I've also made two tape-sim FX chains and it would be nice to get some feedback on them. Feel free to edit and update these to your liking. I just created 5 new projects, with the first using New From Template, the 2nd using New Project, the 3rd using File > New, the 4th using ALT+F then N, and the 5th using CTRL+N, to see what each option did with audio. 1) Start Screen 'New Project' option - The project created from the Start Screen's 'New Project' option does NOT default to use Per Project Audio, and saves audio to C:\Cakewalk Projects\Audio. Doing a Save As presents the audio path for MANUAL modification, but any audio created prior to modifying that goes to the path listed above. If you want to use Per Project Audio - I would not use this option. 2) File > New option - Creating a project using File > New behaves differently, and DOES present the path for the Audio to be stored in an Audio sub-folder - as the new default for Sonar has Per Project Audio turned on. The path for the Audio sub-folder is populated automatically to create a folder called Audio within the project folder, so as you type the name of the project, the path for the Audio sub-folder is modified to include whatever you are naming the project as the parent folder for the Audio sub-folder (because Per Project Audio is on by default). This option is fine for creating projects with Per Project Audio automatically on. 3) Start Screen 'New From Template option - Creating a new project by choosing 'New From Template' on the Start Screen, ALSO presents the path for creating an Audio sub-folder within the project folder, and automatically adds the project folder name to the path to the Audio sub-folder (just like File > New does). This option is fine for creating projects with Per Project Audio automatically on. 4) ALT+F then N works the same way that File > New works, resulting in an Audio sub-folder within the project folder, and the path is automatically populated as you type in the project name. This option is fine for creating projects with Per Project Audio automatically on. 5) CTRL+N option - this does NOT work like File > New. You will NOT have an Audio sub-folder created. It will default to the global Cakewalk Projects\Audio folder, though you can change that path during Save As. Audio clips created prior to a path modification to its default will indeed be stored in the global Cakewalk Projects\Audio folder. If you want Per Project Audio is desired, I would not suggest using this option. For whatever it's worth, I ALWAYS start new projects using the Start Screen 'New From Template' option, and I always end up with an automatically created Audio sub-folder, within the main project folder, and all of my audio clips properly stored within the Audio sub-folder, as a result of the default Per Project Audio option in Platinum. Community Tip: Using the Transpose function with Diatonic math checked. Hey, a heads-up to all you "Friday's Tip of the Week" insiders. The number of tips has gotten unwieldy, and some of them are kinda old at this point (and age has even rendered some of them inaccurate). I've been trying to figure out a solution, so here it is. I'm currently working on consolidating/compiling the tips, updating them, adding screen shots, including some more tips, organizing them by categories, and basically, converting them from a bunch of forum posts into a book. Once that's available (which may be a while...depends on workload), I'm going to hit reset and start over with a new "Friday's Tip of the Week" thread. I dunno, maybe I'll call it "The Friday's Tip of the Week Strikes Back" (kidding). Until the book is done, I'll keep adding to this thread. I must say that I deeply appreciate the support y'all have given this endeavor, and there are plenty more tips that need to be written so this is not going to go away unless there are circumstances beyond my control (e.g., earth being destroyed by aliens, a pack of wild dogs eating my computer, etc.). I also want to give a BIG shoutout to all the people who have contributed comments, additional tips, etc. Although there are too many to mention, I'd particularly like to thank Soundwise for her ongoing contributions...but every one of your comments and suggestions has added to the value of this thread. 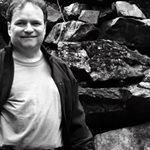 This truly is a very special community of people, which is what provides the incentive and desire to continue writing these tips for you. I've seen quite a few requests for the ability to have Track Folders in the Console View. I've thought about this, and realized it's not so much Track Folders I want; it's the ability to make tracks go away that I don't want to see, quickly and easily, make them re-appear equally easily, and not have to jump through hoops to edit them. You can do that with Folder Tracks in Track View, but you can't do the same thing in Console view...or can you? For example, once an instrument's MIDI track is done (I use synth Track Folders with separate audio and MIDI tracks), the attention shifts to the audio track when you're mixing - so you don't want to see the MIDI track. 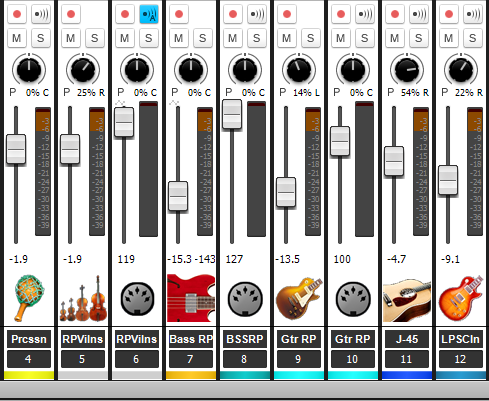 Or consider a multiband distortion setup, where the different bands are in a Folder Track. If there are five bands, that's five channels in your Console view that you probably don't want to see after the initial mix setup. Granted you can hide tracks, but then if you want to dip in and do some quick editing, you need to open the Track Manager, find your tracks, unhide, click OK, etc. Besides, at that point you probably want to be dealing with the Track View, not the Console View or the Track Manager. So, this is tip is about quick, temporary track hiding in the Console View - and when you want to do some editing, or get the tracks back, you'll be right where you want to be. Before you start, though, type H to bring up the Track Manager. Make sure "Keep Track/Console Visibility States in Sync" is checked. Here's part of the Console View. The Strings, Bass, and guitar Chord Library instrument tracks all have MIDI tracks next to them that we really don't need - we're mixing audio, right? Next, note how the instrument tracks are handled in track view: the Folder Track is opened up just enough to see the fields under Audio, MIDI, Synths, and Hidden. Click on the MIDI fields, and you can show/hide the MIDI tracks in the Console. Here's what happens from hiding the MIDI tracks...better, eh? What's more, this can also hide tracks in a Folder Track - just click on the Audio field instead of MIDI. You won't see the Folder itself in the Console, because all the tracks will be hidden. But to make them reappear, in Track View just click on the Track Folder's Hidden field, and they'll re-appear. But here's the best part in terms of workflow. Suppose you do want to do some quick MIDI edits. Go to the Track View, click on the MIDI field for your instrument, unfold the Track folder if needed, and there's your track - ready for editing. No messing with the Track Manager, and no need to mess with dialog boxes - when you're done editing, click on the MIDI field again, return to the Console view (using the cognoscenti "D" keyboard shortcut), and you're back to the cleaned up Console view. I've now gotten to the point where I leave the Folder Tracks slightly open as shown. Between being able to click on the fields and alternate between Console and Track views with the D key, I can move really fast when I want to see - or not see - some, or all, of the tracks in a Folder Track when using the Console View. ... You can do that with Folder Tracks in Track View, but you can't do the same thing in Console view...or can you? Due to recent retirement from my day job, I'm finding it rewarding to dig around in Sonar more. This time, I'm not able to duplicate your tip functionality (at least not yet). When I set up a track folder and populate it with MIDI and audio tracks, clicking on the folder indicator numbers under each type hides and shows the tracks just as you describe. But for me, the change in visibility is only happening in the track view with no corresponding change in the console view track visibility. I'm still on a learning curve with track folders, but I'm wondering if there are any preference settings or specific docking choices that would cause this disconnect between track and console. Then, when poking around for pertinent settings, I noticed at the top of my console view a series of drop down selectors (Modules, Strips, Track, Bus, Options). Under the "Strips" drop down, there is an option to select or deselect "MIDI." Deselecting "MIDI" instantly makes all the MIDI tracks go away from the console view whether they are in folders or not. Seems very handy exactly for the reasons you mention. Re-selecting "MIDI" brings them back into the console view. 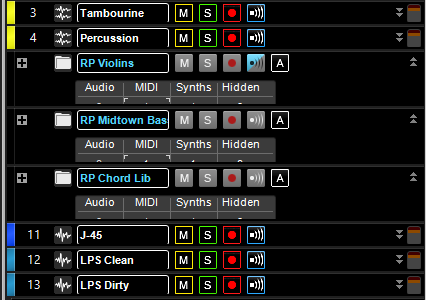 The strips menu does not offer a way to easily show/hide user-unique kinds of track groupings (different bands, etc.) the way your tip apparently works, but the vast number of Sonar controls made it easy for me to not know about the built in solution for showing/hiding MIDI tracks in console view, at least until now. Thanks for stimulating me to learn more. Sonar Platinum lifetime plan, i7-4930k 3.4 GHx, 32 GB RAM, 2 TB SSD system drive, Dell 2560x1600 monitor, Windows 10 64bit, Edirol UA-101, Nektar LX88+. 1. This the my audio mixing screen. 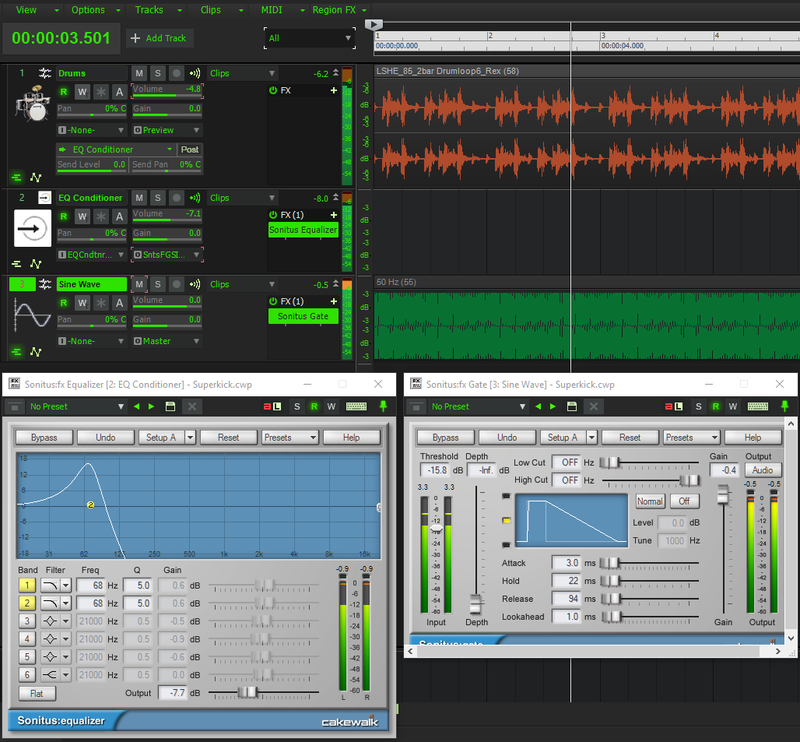 On two of my three monitors, the bottom left one is the main screen that includes the track view. The right one has the mixing console. For this screen I go into track manager and hide all the MIDI tracks since I'm just mixing audio. 2. In this screenset all of the MIDI tracks are unhidden. The left screen still shows main view, but the right screen shows shows the piano roll. I use this screenset when I want to edit MIDI tracks either with a punch in on a synth, or manual tweaking the MIDI notes. A simple screenset swap "hides" or "unhides" the MIDI tracks and sets up the right screen for the right application view. BTW, count me in for your ebook! If you do hip-hop or EDM and don’t try this tip, in the immortal words of Herman Cain—“blame yourself.” This tip turns wimpy kicks into superkicks, using a different technique compared to the Drum Replacer. I’ve posted an audio demo at craiganderton.com on the Demos page so you can hear how cool the kick becomes. The basic concept is to add another track with a low-frequency sine wave, tuned to your pitch of choice. This can be a WAV file, but we’ll talk about how to take this to another level after we get past the basics. An Aux Track “listens” to the drum track, and uses EQ to filter out everything except the kick; you don’t hear this audio, but we use it to gate the sine wave so it tracks the kick. Let’s check out the setup (and a tip o’ the hat to Jeremy Habetler for the cool Green Glow theme...nice work!). 1. Track 1 is your drum loop. Insert a pre-fader Send that goes to an Aux Track (named “EQ Conditioner” in this example). 2. Temporarily insert a Sonitus EQ into the drum track’s FX Rack. Tweak the response to filter out everything but the kick. You may need only one lowpass filter band, with the Q kicked up to about 10. Start at the lowest frequency, then slowly move up until you hit the frequency that best isolates the kick. However if other drum sounds creep in (like low floor toms), you may need to double up on the lowpass filters, as shown in the screen shot. 3. Drag the Sonitus EQ out of the drum track and into the Aux Track. 4. Now add the track with the low-frequency sine wave, and insert a Sonitus Gate. 5. Assign the Aux Track output to the Sonitus Gate Sine Input. 6. Because the drum track Send is pre-fader, you can turn down the drum track while you adjust the Gate for the best possible sound. Start by setting the Gate Threshold to let the sine wave through when the kick hits. Because the sine wave is very low frequency, you need to set the Attack/Hold combination to be longer than an individual cycle. For example the period of a 50 Hz sine wave is 20 ms, so a hold time of 22 ms makes sure the gate doesn’t trigger on individual cycles…although if you want some really nasty lo-fi distortion, be my guest and use short attack and hold times. Also, it’s a good idea to use some Lookahead; 1 ms is enough. How you set the gate provides a ton of options. Extend the Release for a “hum drum” effect, or automate this control for more expressiveness. Increasing the Hold time alters the character as well. The Threshold setting is crucial to avoid false triggering. If you use a virtual instrument instead of a WAV file to generate the sine wave, you can pitch the kick with a MIDI track, as required by the song. 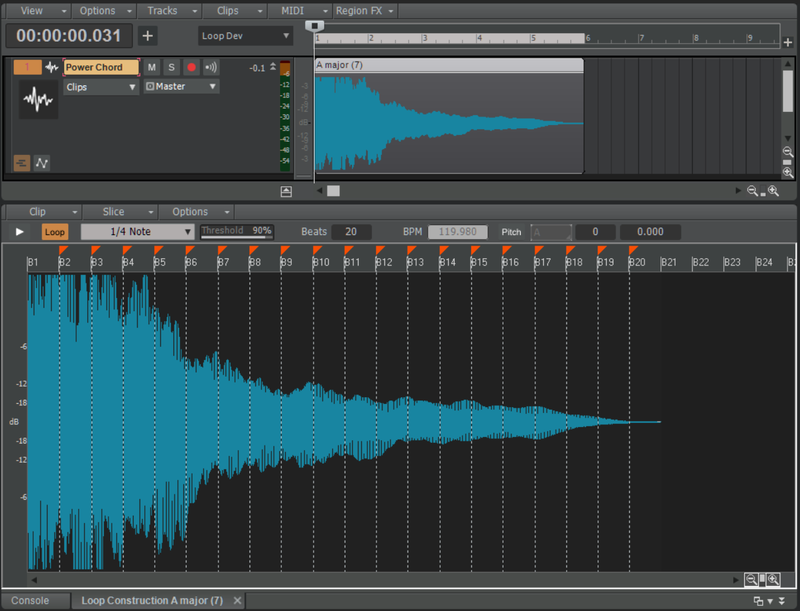 Or, use SONAR’s transpose function on a WAV file. You can also use this to add more "bottom" to snare drums, providing you can isolate it enough from the rest of the drums. Thanks for the little nod there, I have updated the theme since the new update introduced the notes tab. Maybe I don't understand what you need to do exactly, but assuming MIDI bass, copy the track, set all the notes to the same pitch, and trigger the kick. If not MIDI bass, use Melodyne Essential to extract MIDI and do the same thing. Funny was just doing this yesterday and saw your tip this morning. I used the Low Cut/High Cut in the Gate to do the EQ stage. But yeah handling that outside the gate would allow for more precision. Definitely pays to explore, experimented with a layer of synth loops and set the gate to duck, came up with a cool locked to the drums rhythmic part. Yes, I'm quite a fan of sidechaining...I covered several applications in the first generation of tips. One of my favorites involved ducking reverb when an instrument played to avoid "stepping on" the instrument sound. A tried-and-true technique to impart rhythmic characteristics on a part is to use side-chaining. For example, if you feed a pad into a gate and use a drum part as the gate's sidechain signal, you can “chop” the pad so it follows the drums. However, the Loop Construction View has yet another little-known talent that can let you “percussivate” any part. This technique can do all kinds of other tricks, like make it easy to create “faux” REX files, but for now let’s look at how to take a heavily compressed power chord and make it pulse rhythmically. But first…go to Preferences and choose Customization > Editing > Clips > Right Portion for “Selection after Single Split.” You’ll see why this is important in Step 8 below. 1. Make sure the Clip you want to “percussivate” has a defined number of beats. 2. Double-click on the Clip (the default double-click behavior for Clips) to open it in the Loop Construction View. 3. Click on the Loop button and verify that the Beats field shows the correct number of beats. Note: This may appear to truncate the clip in the Track View. Never fear—simpily slip-edit the Clip's right edge to show the entire clip. 4. Use the drop-down menu below the Slice drop-down menu to choose the "pulse rate," as shown by where the transient markers fall. The screenshot shows quarter notes, but you can also choose “No Slice” to add markers wherever you want (by double-clicking just above the Loop Construction View’s “time ruler") to create polyrhythms and syncopations. 5. You can close the Loop Construction View once you’ve placed your markers where you want. 6. Click the Clip to select it, and place the Now Time at the beginning. 7. Press Tab. This places the Now Time on the first transient marker. Type S to split the Clip. 8. Keep hitting Tab and typing S until there are splits on all the transient markers. This is why you want to select the part of the clip to the right of the split in Preferences—typing S won’t add a split unless the region you want to split is selected. The screen shot shows what the Clip looks like when you’re halfway through the process. 9. Drag across all the slices to select them all. Now if you add a fade to one slice, you’ll add it to all of them. 10. You may need to add a very short fade in as well to prevent clicks. This only has to be a couple milliseconds, so it's not necessary to compromise the sound's percussive nature. 11. To make these changes permanent, and turn the loop-based clip into a standard clip, bounce the clip to itself (i.e., with all the slices selected, choose Clips > Bounce to Clip(s) in the Track View menu). And there you have it—your "percussivated" power chord! But...what good is a "Friday's Tip of the Week" without a "But wait! There's more!"? Please note that this tip shows a very basic application. For example, while you’re in the Loop Construction View, you can also change the pitch, pan, and level of each slice to do “audio step sequencer” effects, as described on page 203 in “The Big Book of SONAR Tips.” You can also split a Groove Clip into its constituent parts to create "faux" REX files without using AudioSnap, split REX files and shuffle the slices to create variations on a loop, and more. Is it any wonder I feel the Loop Construction View is one of SONAR's most under-exploited features?